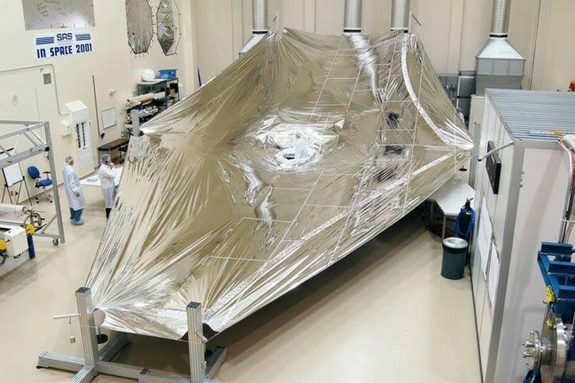 The sun shield created for the James Webb Space Telescope (Credits: NASA/Northrop Grumman). The deployment will make use of advanced mechanisms that are being developed by various contractors, such as Northrop Grumman Astro Aerospace in California, where the mid-boom assembly is currently being manufactured. Challenges include ensuring that the layers do not get tangled upon opening and that the surface coatings do not get rubbed off in the process. The kite-shaped layers will shield the telescope from the sun’s ultraviolet radiation and at the same time protect it from high-speed impacts with the ever-increasing amount of tiny space debris. While the sun-facing side of the sun shield will block out sunlight, the side facing away from the sun will minimize light scattering and heat. The Hubble Space Telescope is currently equipped with a light shield, but it is nothing like the new, enormous sun shield in the works for its successor. Previous missions have unfolded large antennas, but never a membrane of this size. In order to fit inside its launch rocket, the shield will be folded compactly around the telescope. When the telescope reaches its destination, at the second Lagrange point 1.5 million km from earth, the sunshield will be deployed using a small telescoping tube mechanism. The James Webb Space Telescope is set for launch in 2013 and will make observations mainly in the infrared range of the electromagnetic spectrum, with some capability in visible light. Video below from Northrop Grumman Astro Aerospace, with engineers explaining the deployment mechanism of the mid-boom assembly (Credits: NASA / STSci).